What actually happens in a Bokashi bin? 11 Comments on What actually happens in a Bokashi bin? Do you remember the first time you looked in your first-ever Bokashi bucket? All the excitement of a sparkling new project on the go. Hopes and dreams about changing your life, changing the world. So you open your bucket and… Nothing. Just food scraps. Sort of mushy, but still — food scraps. Is that it then? Doesn’t it get any better than this? The thing is that there IS a lot going on in that bucket. It’s just that we can’t see it. The first thing to face up to is that you won’t get soil in your bucket. Never. Ever. Just doesn’t work that way. What you will get is pickled food scraps. That look exactly like the food scraps you scraped off your plate the other day. The “pickling”, or fermentation is a process that is really handy for us. It means we can be as lazy as anything, not have to go out with the scraps to the compost in the dark and slush and not have to put up with the slime, smell and flies you would quite likely have had otherwise if you’re a bit lazy with that compost bin trip. You have to admit it’s quite comfortable having a no-smell bin in the kitchen that deals with everything. But that’s not the reason for Bokashi, it’s actually all about dealing with the food scraps in the way that will give the best possible results for your plants. So what happens in your Bokashi bin actually? The microbes go to work pretty quickly on the food waste and do two things. One, they multiply. Every 20 minutes or so if they like the look of things. 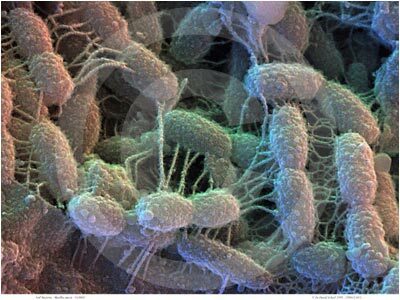 And soon you have a full bin of microbes munching at the bit to get out and do something in your garden. And two, they go to work on your chicken bones, cheese rinds, macaroni leftovers. Food is made up of a lot of proteins and stuff and the microbes job is to break up those proteins into their component parts, which are amino acids. The tiny little bits of the protein chains. If you bury a banana skin in the ground your average tomato plant won’t be able to get much out of it. But if that same banana skin had been through a Bokashi bucket first your tomato plant would be able to “eat” it directly. That’s because the plant can take up the nutrients in the amino acids with help of the microbes, it’s a kind of package deal. I think you could sort of compare it to turning up at a big Christmas dinner. On one table is a pig. On the other is a beautiful array of turkey slices, meatballs, vegetable dishes and dessert. Complete with knives and forks and everything else you could ask for. Which would you choose? What do the microbes add in all of this? A lot. As well as basically serving up the food in bite-sized portions ready for the plants they tend to do all the running around. Talk to the plants (through their roots) and ask what’s on their wish list for the day in the way of nutrients. Like little mini waiters they then scurry off and fetch the required dishes. And their tip? A nice dose of sugar from the plant, delivered in some way via the roots. If the same food scraps had gone straight into a traditional compost they would also have become soil in the end. But in the process most of the nutrients would have leached away. Much of the carbon in the compost would have gone up into the atmosphere in the form of methane and carbon dioxide. And the nutrients that remained would have lost their valuable “fast-food” structure during the rotting process. Nothing against composting — but it is a very different process to fermentation. Now I’m no biologist so I know this is ridiculously over simplified. If you can add something to the description or put it right I’d love your feedback. But all in all I think our buckets and their billions of microbial residents deserve a great pat on the back for a job well done. Over and over and over again. So even if there’s nothing much to see when you empty that Bokashi bucket there’s a lot to be grateful for. And the real thanks is the happy bouncing plants you get at the end of the day. It’s just that there’s more teamwork involved than you’d ever imagine! I had to share this one with my Facebook peeps. Lots of good info here, Jenny! Thanks for sharing it with us. Good to hear it’s come in handy Desi! Hi Jenny, this was a very good simple explanation of how things work inside the bucket. Thanks guys! And good point Fred. Probably it’s also a good sign that our families are eating well too when there’s a good mix of stuff in the bin. All tips and ideas much appreciated! Nice article Jenny! Pickling is such a good description because a lot of people I talk to expect to see food waste broken down in their bin. But something that is pickled still looks the same, but its internal structure has changed (and tends to be softer!). May I post a link to this on Facebook? You’re right, I’ve lost track of how many times I must have said “you don’t get soil in your bucket”! But the whole Bokashi thing is quite strange and different in the beginning so it’s not surprising these misunderstandings come up. That’s why we’re here, right?! And of course — please go ahead and link this if you’d like! Good luck with your ongoing process there. After a couple of bins you’ll be a pro! Hi. the inside of my Bokashi bin is now growing a white fungi. Is this a good thing? Is it signalling that I should bury the contents or have I left it for too long? Hi! White fungus is fine, in fact it’s a sign that the process is doing what it should. You don’t always get it in a bokashi bucket, so it can’t be used as a timing indicator really. The two situations where you’re most likely to get white fungus is when your bucket is slightly less than airtight (airtight enough but not super tight) or when your bucket has been standing for a while. As a rule of thumb, a bokashi bucket should be left to do it’s thing in room temperature for two weeks after it has been filled. Less time may be ok if you live in a hot climate but two weeks is always good. On the other hand, it doesn’t matter how long it stands before you get round to emptying it, although generally it’s better to keep things moving so your garden gets the benefit. Not sure what the situation is in your case, but either way you can definitely go ahead and dig it down now. Wait a couple of weeks before planting in it, so the pH can stabilize, then you’re in business. ...to our blog on all things Bokashi. Bokashi is the great new way of dealing with organic household waste. Making it part of the solution instead of part of the problem. Next Entry Autumn leaves make great pumpkins! Make your own "soil factory"!